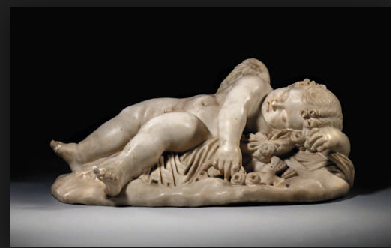 A Sleeping Cupid, a popular statue in Renaissance Italy, copied hundreds of times. Did Michelangelo’s statue look like this? It resembles sketches he made. April Fool’s Day is celebrated in many countries around the world on this day. In a world where fake news is all around us it is sometimes difficult to recognise what if fact and what is fiction. The best April Fool’s hoaxes are those that we know are fake but still fall for them. Two famous April Fool hoaxes in the UK come from the BBC – the spaghetti tree harvest (1957) and the flying penguins (2008). The lgbt community is not immune to producing or receiving hoaxes. I’ll write about several of them throughout the rest of the year. What I won’t write about are the dozen or more claims made in recent decades by lgbt people who have deliberately faked anti-gay abuse or discrimination. This first article recounts a hoax from 1496 that established Michelangelo as one of the greatest artists who has ever lived. For an artist who produced the masterpiece of the ceiling of the Sistine Chapel Michelangelo preferred sculpture. The Renaissance was at its height and he had the good fortune to study at the sculpture studio in Florence, the epicentre of the Renaissance world. The ruler of Florence, Lorenzo “the Magnificent” de’ Medici, became his patron and the teenaged budding sculptor became acquainted with all the top thinkers and artists of his age. In 1492 Lorenzo de’ Medici died and a period of political and moral uncertainty emerged in Florence with the rise of the ultra-conservative and puritanical Bible-thumping monk Girolamo Savonarola, one of the few people who makes the Westbury Baptist Church sound lgbt-friendly! Michelangelo thought it best to leave Florence, for any connection to Lorenzo de’ Medici was suddenly seen with suspicion. Michelangelo only had a taste of the life he was to acquire. He was now in danger of returning to the life of a struggling sculptor looking for a wealthy patron. It was at this point that a fake made his fortune. The year is 1496. Michelangelo continued to sculpt and came up with a classical-style figure of a sleeping cupid. Lorenzo di Pierfrancisco de’ Medici, a cousin of Lorenzo “the Magnificent”, saw it and commented that if it was deliberately “aged” it would easily pass as an ancient statue that could fetch a high price. Kerching! At this point the facts get a bit fuzzy. Some accounts from the time say that Michelangelo took on the aging process himself, burying the statue in acidic soil for several months. Some accounts say it was art dealer who sold the statue who did it. This art dealer, Baldassari di Milanese, was a typical middle-man who took the biggest cut of the sale. Whoever did the aging of the Sleeping Cupid statue it ended up being bought by Cardinal Raffeallo Riario for 200 ducats. Michelangelo received only 30 and Baldassari kept the rest. The cardinal was convinced the statue was genuine. A year later the cardinal became a bit suspicious. He had heard rumours of convincing fake ancient statues coming out of the studios in Florence and he despatched agents to make enquiries. They managed to track Michelangelo down who admitted to the forgery. The cardinal was both angered and curious. Angered that had been conned, and curious that such a young artist such as the 20-year-old Michelangelo could produce such a convincing fake. Michelangelo said he could prove he had great talent. He asked the cardinal to watch as he made a drawing of his own hand. Impressed by the result the cardinal invited Michelangelo to Rome and agreed to become his patron (some accounts say it was the cardinal’s agents who watched him sketch his hand). As for Baldassari di Milanese, he was forced to pay back the 200 ducats he received from the cardinal. Fortunately, Michelangelo was allowed to keep the 30 ducats he had received. It was Baldassari who was the only loser in the whole affair. Michelangelo’s reputation rocketed after that. Within five years he been commissioned to produce two of the world’s greatest masterpieces – the “Pietá” and “David”. As for the Sleeping Cupid, it was later part of the prestigious collection of the d’Este family, the rulers of Mantua. It was then sold with the rest of the d’Este collection in London. The cupid was bought by King Charles I who put it on display in Whitehall Palace. Unfortunately, Whitehall Palace was destroyed by fire in 1698 and so, too, probably, was Michelangelo’s Sleeping Cupid. At least for Michelangelo his forgery only helped to establish his career. In July I’ll write about another gay man who’s fakery only helped to destroy his.